After the most recent interest rate increase in June, the Federal Reserve has signaled that it is likely to continue raising interest rates this year, possibly even as often as once per quarter. In fact, fear that interest rates may rise faster than previously predicted has caused some volatility in the markets. Bond investors have been concerned about this for years, but this time it looks like it’s going to happen. Warren Buffet said, in his latest shareholder letter, that “Often, high-grade bonds in an investment portfolio increase its risk.” That can be true, but then, we don’t all have Warren Buffet’s net worth to fall back on! 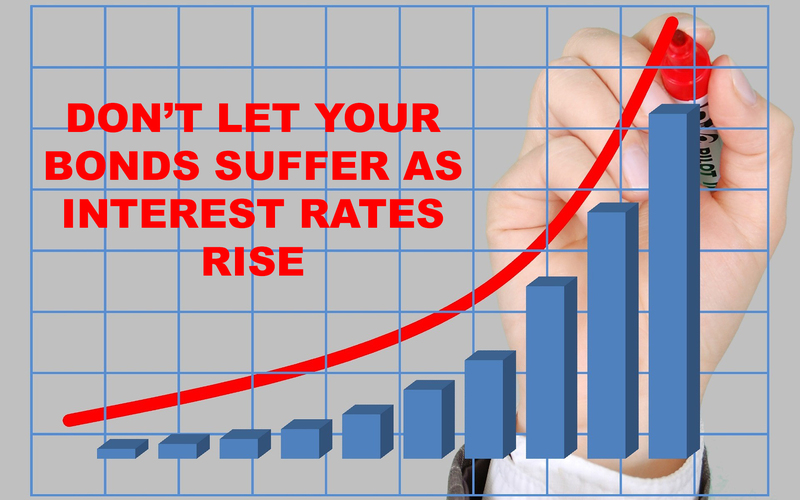 That may have you wondering – how can I take advantage of rising interest rates? And, generally speaking, bond yields go down as interest rates increase. But remember, while bonds may decline in value, their moves tend to be smaller compared to other securities. Many investors are flooding into U.S. Treasury bonds, making the so-called flight to quality, because right now, the U.S. looks better than other economies worldwide. This means that medium and longer-term bonds – whose rates are often more influenced by investor expectations than anything else – are likely to be most affected. But, there are many strategies you can use to manage your bond portfolio in a rising interest rate environment. For Treasury inflation-protected securities, or TIPS, the Treasury Department uses the Consumer Price Index to adjust the principal for inflation (or deflation) twice a year. At maturity, the investor gets either the inflation-adjusted principal or the original principal, whichever is higher. They can be a great way to capitalize on rising interest rates. Another smart strategy is to invest in single corporate bonds. You can structure this based on income needs, and then you’re never forced to sell, and can simply hold them to maturity. And keep in mind you don’t want junk bonds – you want quality – bonds that have an AAA or AA rating according to Moody, or Standard and Poor. A third smart strategy is buying single municipal bonds, which are often “triple-tax free” – they sometimes avoid local, state, and federal taxes. A final strategy is a bond ladder. A bond ladder is a structure where you own individual bonds with, as an example, 20% percent of the bonds that mature in two years, 20% percent that mature in 3 years, 20% in 4, 20% in 5, and 20% in 6. The idea is that in each year, as 20% percent of the bond ladder matures, this amount is reinvested in a new five-year bond. If rates have increased, the yield on that "new" four-year bond is likely to be much higher than the four-year bond that was purchased just one year ago. These ladders can bring balance and discipline to a bond portfolio, and it doesn’t require timing the interest-rate environment. As long as rates increase over time, which they look likely to do, a bond ladder ensures there is regularly available capital to reinvest at higher rates. Keep in mind that these strategies all apply to purchasing single bonds. But, if you prefer bond funds, you have some strategies there as well. First, look for what we call an unconstrained fund manager. That means that they can invest in domestic and international bond funds. Remember, while interest rates may be rising in the U.S., that isn’t the case in many other countries, and they may have environments that make bonds attractive. If you have questions about your bonds, or other strategies to benefit from rising interest rates, we’re here to help! We offer a free, no-obligation consultation. You can schedule your appointment today by calling us at 216.521.1711, emailing us at Quarterback@Lineweaver.net, or by clicking here.